Skin tannins make you feel like you just had a bite of an unripe persimmon. 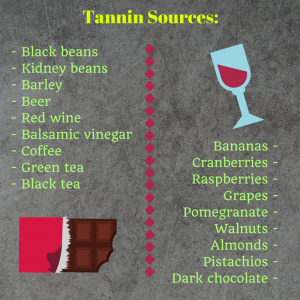 Skin tannins can be very astringent. Over time, in the bottle, they can smooth out. The longer the skins were on the grapes, the rougher the wine. We generally leave the skin on for about 8 days. 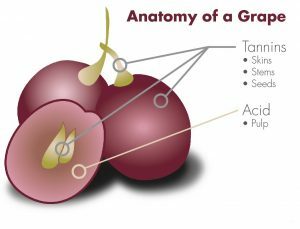 The color comes from the skin, yet within the first hour after picking the grapes; the skins have already started to “bleed,” to create the color of the wine. Tannins that occur from seeds aren’t really tannins, but have similarity that they have been categorized together. They tend to be bitter, so when winemakers press the grapes they are usually gentle. Cheaper wines usually press the grapes heavily which releases a bitter taste, but the residual sugar sometimes covers up the astringency. New oak barrels have tannins that can be overpowering for young wines, especially which have thinner skins than other wines. These types of wines should be decanted or use an aerator to help smooth them out. Most tannic wines need food to help round out the astringency. When wine tasting, don’t forget to cleanse your palate with crackers to help taste and get a true feel for each wine. If cheese plates or chocolate is available, makes sure to ask if what wines pair best.